The ENDEAVOUR became famous as the expedition ship of James Cook on his first voyage. He set sail on 25 August 1768 from Plymouth to his study of the South Seas. On that journey he went to Tahiti, Tubuai and other islands, then to New Zealand, the northeast coast of Australia, and finally to Batavia. Via the Cape of Good Hope he returned to England, where he could throw anchors in the Downs on 12 July 1771. In Wikipedia there are two fine articles on James Cook and his ship ENDEAVOUR. In 1993 a replica of the Endeavour has been built in Australia. I took many pictures of that ship when it made a trip to Europe. The model was built to plans by Marquardt (Karl-Heinz Marquardt, Captain Cook's Endeavor (Anatomy of the Ship), Conway Maritime Press 2010, ISBN 0851778968). It is a very beautiful true masterpiece, showing fine details in the hull and the rigging. The ship model is 1 : 45 scale. Length is 110 cm, width 36 cm, height 105 cm. 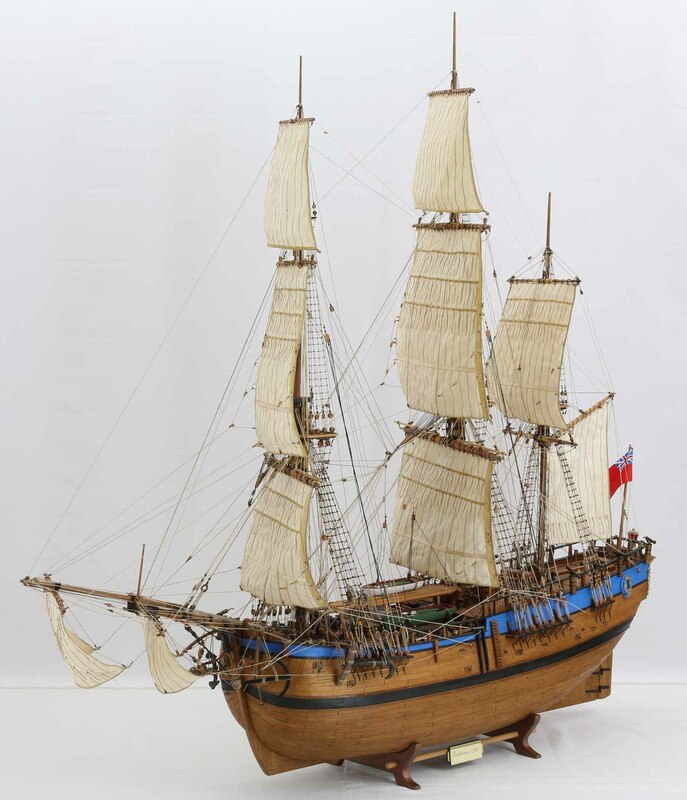 There is a set of photos, several views of the entire ship model taken from all directions, and several closer views of hull, deck and rigging. Click images to enlarge!